This recipe serves 8 large servings. Adjust proportions to the amount you wish to make. Karen and I eat this for 4 consecutive days (8 servings). It’s amazing how fresh the marinade keeps the salad for this period of time. Store covered in refrigerator. 1 ½ cup olive oil. Rinse the rice in a fine strainer. Place the rice and water in a medium pot. Bring to a boil and turn heat to low and simmer until soft (40 – 45 minutes). After cooking I put a lid on the pot of hot brown rice and allow it to sit for another hour. This enhances the tenderness of the rice. Add all three marinade items together and whisk thoroughly and repeatedly. After cooked rice has been sitting for an hour or longer (covered) add to above marinade. Stir with spoon periodically to keep mixing rice with marinade. Initially the rice will have an inch of liquid on top, but after several hours the rice will completely absorb the marinade. After 4-5 hours the rice will completely absorb the marinade. 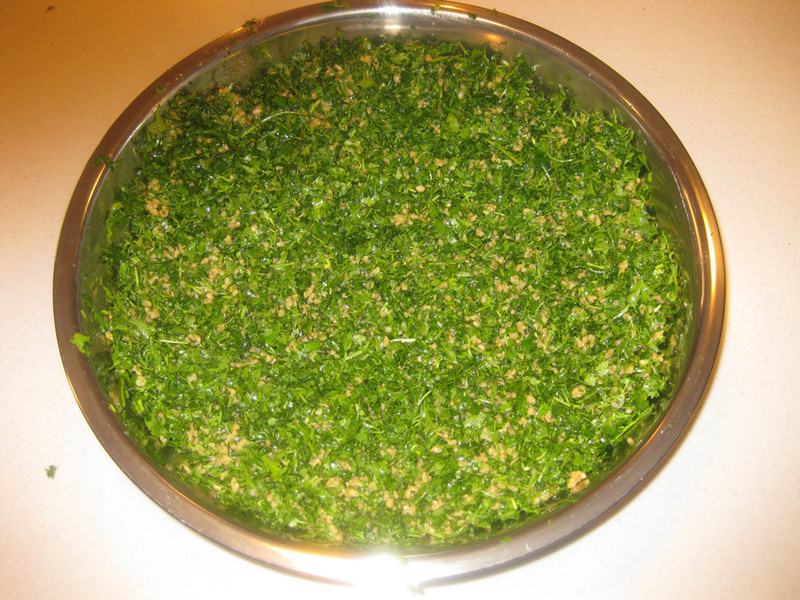 Wash parsley thoroughly by soaking in water in the sink and gently stirring with hands. Rinse and wash again if necessary. Don’t be surprised if significant amounts of “mud” and grit are removed. Then wash cilantro the same way. 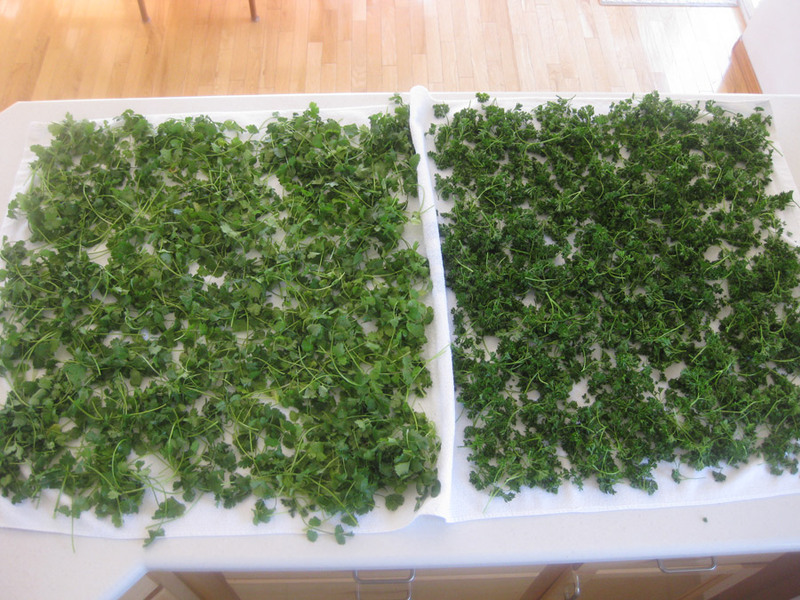 Next dry the parsley & cilantro thoroughly. 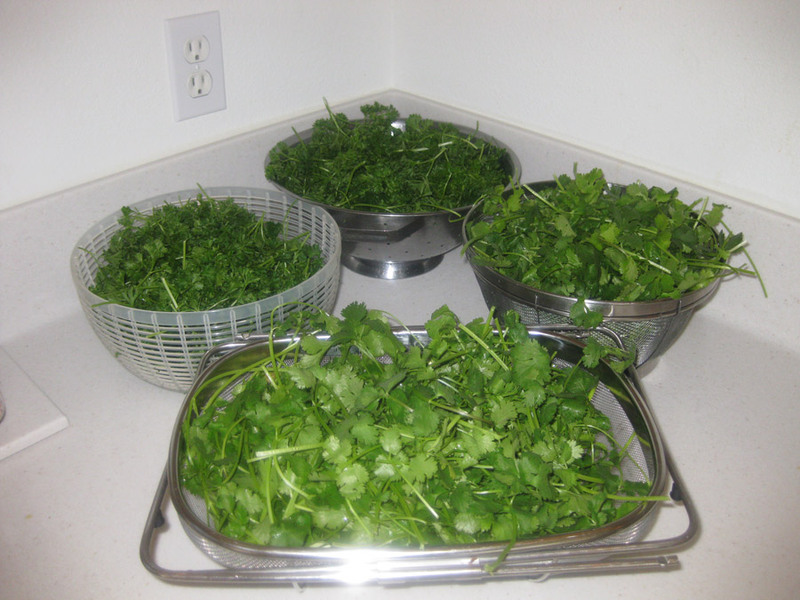 I allow gravity to remove as much water by placing produce in strainers. After this I spread produce on clean towels to remove even more water by allowing it to sit for hours or as long as necessary. A vegetable spinner is another option. It’s important to have relatively dry produce before adding the brown rice marinade. 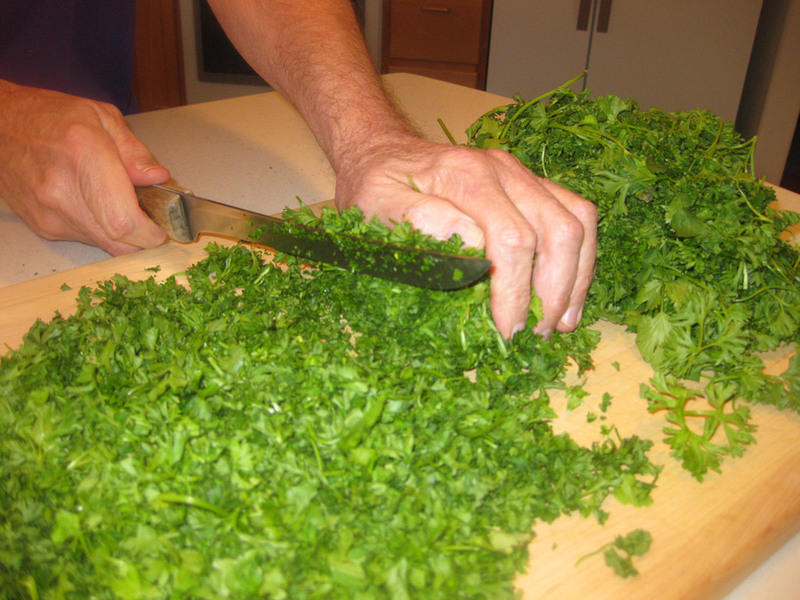 After parsley & cilantro are dry, use a large sharp knife to “shave” it into small pieces. I take one item at a time (parsley or cilantro). Use one hand to compress into a ‘brick’ and shave it with the other hand, using a sharp knife. Or, you can use a food processor but try to avoid bruising. Use one hand to compress into a ‘brick’ and shave it with the other hand, using a sharp knife. 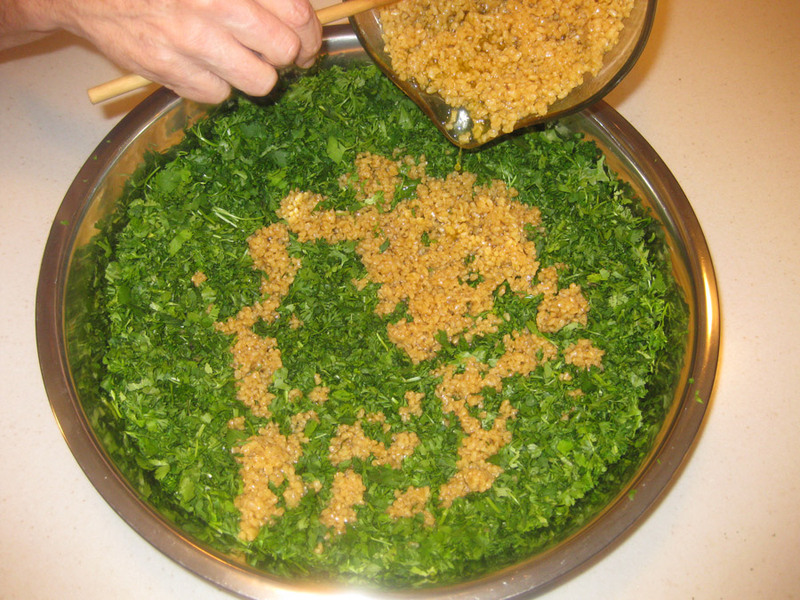 Place chopped produce in a large bowl, mix and fluff and then add brown rice marinade. Use your hands to thoroughly mix all ingredients. At this time you can add anything you wish. I like to add 1 chopped apple and 1 cup organic Sultana Raisins. Mix thoroughly. Each time this is served I add or put on the side the following: fresh chopped scallions (green onions), celery, red pepper and carrots. But add anything you wish or just enjoy the base salad as is. Sprouts are an excellent addition. Serve as is or add a protein – vegetarian or otherwise: hummus, eggs, wild fish, meat, poultry, cheese, tempeh (I like tempeh sautéed with mushrooms), or anything you wish. Nuts are another nice addition. Consider adding additional olive oil, balsamic vinegar, cider or rice vinegar, and additional gluten free tamari…or whatever you like.